Although I don't really think "we're on the brink" (most of our economic growth stats outpace the nation), I do partially agree with it, with some caveats. Our air pollution is getting better/lower every year, although maybe not as fast as some would like. We have such a vibrant economy, and are a border state, so we attract a lot of uneducated immigrants (both domestic and international) without health insurance looking for work. The opportunities are better for them here, and they're better off here. So we're never going to look great on those sorts of stats compared to most other states. It's like Europe: you can severely limit immigration and reduce opportunities, but make your stats look better as you exclude certain disadvantaged groups from your population, but is the world any better off by keeping those groups away from opportunities? Countries, states and cities seem to play these games of "hot potato" with disadvantaged populations, trying to push/keep them over the border into other jurisdictions to make their own stats look better (and reduce their welfare costs), but it actually makes the world as a whole worse off (for the same reasons protectionism makes everybody worse off vs. free trade). Texas has always pretty much welcomed anybody seeking opportunity and willing to work hard, but in exchange we don't offer much of a welfare state apparatus. That's our deal. The states that are more welfare-oriented tend to have fewer opportunities, play the "hot potato" game by doing things like restricting housing to make it unaffordable, or, like California, simply start to go broke. All that said, we need to make good investments in both lower and higher education. But I think a lot of what is needed are better systems rather than more money, like increased charter school competition and forcing universities to stress teaching and graduation rates as much as research. A final note: my apologies to email subscribers. Last week, the Monday night post didn't end up getting emailed out until Thursday night, right before that night's post, so you got two in one night. I forgot to moderate the message on Google Groups Monday night to send it out. Sorry about the mix up. Paul Graham, the famous tech investor and writer, has a new essay out claiming any city has the potential to be the next Silicon Valley - or at least a close second - just by throwing money at the issue. Specifically, he thinks about $1 billion dollars would do it, distributed in $1 million dollar increments to lure 1,000 top tech startups to town. The assumption is that that critical mass would grow on its own from there, with cash-outs from winners become angel investors in the next wave. A billion dollars might sound like a lot, but he notes it's just one football stadium (or two in our case). For the price of a football stadium, any town that was decent to live in could make itself one of the biggest startup hubs in the world. What's more, it wouldn't take very long. You could probably do it in five years. During the term of one mayor. And it would get easier over time, because the more startups you had in town, the less it would take to get new ones to move there. By the time you had a thousand startups in town, the VCs wouldn't be trying so hard to get them to move to Silicon Valley; instead they'd be opening local offices. Then you'd really be in good shape. You'd have started a self-sustaining chain reaction like the one that drives the Valley. Interestingly, the 30-startup experiment could be done by any sufficiently rich private citizen. And what pressure it would put on the city if it worked. It will be easier in proportion to how much your town resembles San Francisco. Do you have good weather? Do people live downtown, or have they abandoned the center for the suburbs? Would the city be described as "hip" and "tolerant," or as reflecting "traditional values?" Are there good universities nearby? Are there walkable neighborhoods? Would nerds feel at home? If you answered yes to all these questions, you might be able not only to pull off this scheme, but to do it for less than a million per startup. I'd like to point out the original Silicon Valley had nothing to do with "walkable neighborhoods", and was - and pretty much still is - completely suburban. Houston's core still scores pretty well on these criteria. We certainly have more than our share of engineering nerds. I realize the chance of any city having the political will to carry out this plan is microscopically small. I just wanted to explore what it would take if one did. How hard would it be to jumpstart a silicon valley? It's fascinating to think this prize might be within the reach of so many cities. So even though they'll all still spend the money on the stadium, at least now someone can ask them: why did you choose to do that instead of becoming a serious rival to Silicon Valley? Here's my own proposal: bring Silicon Valley to us. Or at least the critical parts. Figure out the hundred+ most important angels and venture capitalists in SV, and get them to agree to a once-a-month day trip (or maybe one overnight + a day) on a chartered plane to Houston to stay at a top-tier hotel (cut a deal in bulk for cheap off-peak Sunday nights) and meet with local tech startups all day - all expenses paid. All they have to do is show up for the flight and we take care of them from there. Then provide high-fidelity telepresence facilities to allow them to mentor their chosen startups between those monthly visits. It's not just about their money, but their extensive expertise in choosing and mentoring tech startups. What do they get out of it? Access to startups, technologies, and talent they would not normally see, with the geography barrier essentially removed. Now, one good argument for why this might not work is that there's not a critical mass of good-quality tech startups in Houston to lure them. But what about Texas as a whole, or at least the Texas Triangle? That's got to be a huge mass of startups, technology, and talent that they'd love to tap. How would that work? Hold your ears, Longhorns: I think relatively central College Station is the answer. Fly them there once a month, and charter buses from all the major Triangle cities on day trips to bring the tech talent/startups to them there. It's within 2-3 hours for most while also tapping talent and technology from Texas A&M, the other top-ranked tier-one public research university in Texas. OK, maybe it could switch between College Station and Austin on alternating months. Austin's not as central, but clearly it's Texas' tech startup capital and may be more attractive to the SV crowd. UT and A&M would be major supporting sponsors, of course (especially their tech transfer offices), maybe donating campus facilities for the meetings and sessions. Branding options: Techxas Day? Silicon Texas Meetup? I'm open to suggestions in the comments. It would be a huge boost to Texas' tech startup scene to be able to tap that Silicon Valley power and money base. And I think we have a critical mass of tech here in the 18+ million-person Texas Triangle that would outweigh any other region of the country in attractiveness to that crowd. In the shorter-term, and on a smaller-scale, Houston needs to get it's own Y Combinator-type incubator program up and running soon, just like Atlanta, Austin and many others recently have. Does anybody know if somebody is putting something like this together? "Houston’s energy industry does have a vulnerability, but it’s not $40 a barrel oil and $4 a Mcf natural gas. It is plug-in automobiles that can run for hundreds of miles on one charge, powered by low-cost, long-lived batteries. That’s when you are talking about change that will alter Houston’s energy franchise. But just as New Bedford, Massachusetts, the capital of the U.S. whaling industry, didn’t die immediately after kerosene and rock oil were introduced into the illumination fuel mix, neither will the oil and gas business die overnight with the introduction of battery-powered automobiles, either. However, the question oil industry executives should be pondering is whether there are, or will be, opportunities for them in the energy business of the last half of this decade. Houston has always been populated by risk-oriented entrepreneurs so we remain confident about the long-term health of this city. But energy as a “definite liability” seems a bit too harsh a characterization of Houston in 2009." Lisa Gray has a Chronicle column on Bob Bruegmann's visit to Houston. Bob is probably the most famous defender of sprawl with his book, "Sprawl: A Compact History". I got to have dinner with him while he was here, and it was a very engaging conversation on the nature of Houston. He was clearly curious to see and learn everything he could about how we developed. Houston's fascinating public art on guidespot. Hat tip to Jack. The Austin Contrarian digs into a little data to analyze minimum parking requirements, albeit with high-density downtown Austin projects. Not sure of the applicability to Houston. Still hoping somebody with access to the data will do an analysis for here. Several factors contributed to Houston's sudden surge to the top of the chart, explains Moseley. "The quality of a place is tied to the affordability of a community," he says. "According to a recent study by the Center for an Urban Future, it takes fewer dollars to be middle class in Houston than it does in New York, Los Angeles, Chicago, Atlanta or Charlotte. It takes just $50,000 in annual income to be middle class in Houston." By comparison, noted Moseley, it takes $123,000 to be middle class in New York, $80,000 in Los Angeles, and $63,000 in Chicago. "Even though we are the number four city in America in population, the cost of living and the cost of doing business is so much of an extreme bargain here," Moseley says. "Plus, we have a delightful climate, we are in the Central Time Zone, and we are the gateway for trade into Central and South America." Moseley says deals like this are the byproduct of a stable market. "A lot of things are organically happening here," he notes. "We did not have a run-up in residential construction and pricing. We don't have zoning, which causes artificial values to be placed on real estate. As a result, there is confidence in the local economy, and we don't have the huge numbers of foreclosures. "The reality is that your dollar goes so much farther here," he adds. "That allows us to be more proactive in going after jobs." Read the whole thing for some detailed examples of the expansions happening here. Hat tip to Christiana at the Partnership. "So, what about Houston? Well, Houston's scorecard can be viewed here. What I find interesting are two things. First, Houston's overall congestion is measured at only 34 percent of that found in Los Angeles, the most congested metropolitan area in the United States. That is because LA has the fewest miles per capita of freeways of any major metropolitan area in America. Second, the data confirms what is probably intuitively obvious to many Houstonians. The overall worst traffic bottlenecks in the Houston area are to be found in the Galleria area. Six out of the top eleven worst bottlenecks are found along IH 610 Loop (southbound and northbound) and various entry or exits to the Galleria, including Westheimer, San Felipe, and Post Oak Boulevard. The exit at 610 Loop and Richmond Avenue comes in at number 22 on the bottleneck list. The good news is that none of Houston's interchanges make the top 100 list of Inrix's worst segments or interchanges for traffic bottlenecks. The bad news, comparatively, is that every single one of Houston's 25 worst bottlenecks climbed up the overall rankings for bottleneck severity when comparing the 2008 data to the 2007 data, but that almost certainly reveals that the downturn in 2008 has affected Houston less than it has other areas of the country, an observation confirmed by the fact that Houston's travel time index declined only slightly in 2008 verses 2007." Here's a map of Houston's congested intersections from NeoHouston. OK, that's more than enough crammed into one post. I'd like to address three distinct but related issues in this post. The first is defending the Grand Parkway, which recently had segment E approved from 290 to 10W. As the Energy Corridor grows its job base, instead of people moving farther and farther out I-10, they can grow up and down the GP - so in that case it actually keeps them closer in than if they move out to Brookshire or Sealy (less sprawl). Loop freeways help keep an urban area more compact and connected. Cities that don’t build them end up with a starfish urban shape, and each arm is relatively independent of and disconnected from the rest of the arms. Not a healthy city if you ask me. If you live on one of those arms, you can’t realistically choose jobs on the other arms and have a reasonable commute. It limits where you work and live and socialize. Loops keep a region unified and give citizens more choices and opportunities. 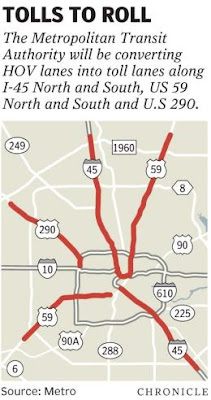 I somewhat sympathize with the CTC that the 290 rebuild should be a higher priority than GP SegE, but 290 is not "shovel ready" and therefore not eligible for federal stimulus. We have to build what we can while the money is available. What I'd like to see HCTRA do is take that SegE positive revenue and invest it in the Hempstead-290 tollway first, delaying the other GP segments. As long as the revenue forecast is strong, they could probably float bonds on it even before it's finished, and use the bond money to start on Hempstead-290 sooner rather than later. "It seems clear that a toll road should be funded by … tolls." Here's the problem with that: Government has a certain pot of tax money to use to maximize mobility improvements. Now suppose, for example, that money is enough to build one free road, or, build three toll roads, none of whom can be completely financially supported by their tolls alone. Assuming equal mobility gains from each, three toll roads are the obvious choice to maximize the return from a limited transportation budget. The tolls help supplement tax funding to get the most mobility benefit for the taxpayer. Better utilization of precious freeway capacity. While not many people will pay the pricey tolls every day, it's a valuable option that's available to everbody when they really need it, whether they're late for a meeting, the airport, day care, or whatever that might be more important to them than a few bucks. That option is a great amenity any of our citizens will be able to take advantage of when they need it. And the secret benefit: top executives, the ones who make the big bucks and can easily afford these tolls (and whose overworked schedules preclude transit or carpooling), are the ones who decide when to give up on an office in the core and move to the suburbs, like Anadarko did to The Woodlands. If their personal commute is miserably slow and long, that's a big incentive for them to leave the city of Houston and even Harris County. Keep them happy, and they help Houston keep a healthy, vibrant core with lots of high-paying jobs and tax base. Kudos to Metro. It can't happen soon enough. Update: Bad news. Metro has delayed the vote to check into ridership, costs, and future expansion. Let's hope they get through the concerns and move forward soon. I will note that, given how full some of the lanes can be already during peak rush hours, they will almost certainly need real-time tolls that sense the load and set prices appropriately. Surges due to weather or accidents can overwhelm fixed toll schedules. I recently came across these excellent principles from the Lone Mountain Compact (hat tip to Josh). For the most part, Houston already follows most of them most of the time, but it couldn't hurt to have them formally adopted by the City Council, the CoH Planning Commission, H-GAC, Harris County, and other entities. The phenomenon of urban sprawl has become a pre-eminent controversy throughout the United States. Recently a number of scholars and writers, gathered at a conference about the issue at Lone Mountain Ranch in Big Sky, Montana by the Political Economy Research Center, decided to distill their conclusions into the following brief statement of principles. The authors have called this statement the "Lone Mountain Compact," and have invited other writers and scholars to join in endorsing its principles. A partial list of signatures appears at the end. The unprecedented increase in prosperity over the last 25 years has created a large and growing upper middle class in America. New modes of work and leisure combined with population growth have fueled successive waves of suburban expansion in the 20th century. Technological progress is likely to increase housing choice and community diversity even further in the 21st century, enabling more people to live and work outside the conventional urban forms of our time. These choices will likely include low-density, medium-density, and high-density urban forms. This growth brings rapid change to our communities, often with negative side effects, such as traffic congestion, crowded public schools, and the loss of familiar open space. All of these factors are bound up in the controversy that goes by the term "sprawl." The heightened public concern over the character of our cities and suburbs is a healthy expression of citizen demand for solutions that are responsive to our changing needs and wants. Yet tradeoffs between different policy options for addressing these concerns are poorly understood. Productive solutions to public concerns will adhere to the following fundamental principles. 1. The most fundamental principle is that, absent a material threat to other individuals or the community, people should be allowed to live and work where and how they like. 2. Prescriptive, centralized plans that attempt to determine the detailed outcome of community form and function should be avoided. Such "comprehensive" plans interfere with the dynamic, adaptive, and evolutionary nature of neighborhoods and cities. 3. Densities and land uses should be market driven, not plan driven. Proposals to supersede market-driven land use decisions by centrally directed decisions are vulnerable to the same kind of perverse consequences as any other kind of centrally planned resource allocation decisions, and show little awareness of what such a system would have to accomplish even to equal the market in effectiveness. 4. Communities should allow a diversity in neighborhood design, as desired by the market. Planning and zoning codes and building regulations should allow for neotraditional neighborhood design, historic neighborhood renovation and conversion, and other mixed-use development and the more decentralized development forms of recent years. 5. Decisions about neighborhood development should be decentralized as far as possible. Local neighborhood associations and private covenants are superior to centralized or regional government planning agencies. 6. Local planning procedures and tools should incorporate private property rights as a fundamental element of development control. Problems of incompatible or conflicting land uses will be better resolved through the revival of common law principles of nuisance than through zoning regulations which tend to be rigid and inefficient. 7. All growth management policies should be evaluated according to their cost of living and "burden-shifting" effects. Urban growth boundaries, minimum lot sizes, restrictions on housing development, restrictions on commercial development, and other limits on freely functioning land markets that increase the burdens on lower income groups must be rejected. 8. Market-oriented transportation strategies should be employed, such as peak period road pricing, HOT lanes, toll roads, and de-monopolized mass transit. Monopoly public transit schemes, especially fixed rail transit that lacks the flexibility to adapt to the changing destinations of a dynamic, decentralized metropolis, should be viewed skeptically. 9. The rights of present residents should not supersede those of future residents. Planners, citizens, and local officials should recognize that "efficient" land use must include consideration for household and consumer wants, preferences, and desires. Thus, growth controls and land-use planning must consider the desires of future residents and generations, not solely current residents. 10. Planning decisions should be based upon facts, not perceptions. A number of the concerns raised in the "sprawl" debate are based upon false perceptions. The use of good data in public policy is crucial to the continued progress of American cities and the social advance of all its citizens. Until recently Texas, and particularly Houston, has been one of the last bastions of that great traditional American optimism--and for good reason. Over the past few years, Houston has outperformed every major metropolitan area on virtually every key economic indicator. Last year, the region was rated among the major metropolitan areas as the best place for everything from earning a living to college grads to manufacturing, according to such publications as Forbes, Business Week and Kiplinger's. Yet even if the green Torquemadas have their way, White thinks Houstonians will find a way to keep their city ahead of the country's other urban sad sacks. Throughout the expansion of recent years, when other cities went on insane spending sprees, Houston has kept the cost of services low and focused on basic infrastructure. Critically, Houston is also among the few big cities that has streamlined its pensions for public employees. So despite all the problems surrounding energy and the encroaching recession, Houstonians continue to be cautiously optimistic about their future. They still excel at all the hallmarks of a progressive economy, such as improving both road and rail transport, reforming the school system and working to expand new industries, such as medical services, that have not yet been targeted by the Obamamians. To be sure, Houston, which missed the Bush recession, is beginning to feel the pain during the new administration's watch. But Houstonians long have displayed remarkable grit and creativity in the face of tough times. Having survived catastrophic energy price declines, several huge hurricanes and endless humid summers, Houston is still among the best bets to survive these tough times and come out, in the end, a strong winner. I've been meaning to get to this one for a while. For the fifth straight year, Houston ranked as one of the most affordable metros in Demographia's International Housing Affordability Survey (hat tip to Hugh, sorry for the delay). Our median multiple of house prices to income is a very modest 2.9. They have some great data in there - check it out. And be sure to also check out Hugh's new web site too - "Performance Urban Planning" - chock full of data and insights on planning, regulations, and affordability. Texas' regulatory laws, relative to those of other states, make it easier and faster for builders to respond to demand, which helped the state avoid developing a bubble, said Metrostudy's Jack Inselmann. The absence of a bubble, he added, also made Texas less attractive to speculators who exacerbate inflated conditions. On the other hand, above-average job growth in recent years, particularly in Houston's energy and Dallas' financial sectors, drove real, sustainable housing demand, Minich said. Many builders are still counting on the state's recent history of economic growth and price stability. Meritage, despite its cautious stance, says Texas remains its "strongest region." No. 3 U.S. builder Centex Corp (CTX.N) said during a recent conference call that it would develop land in a few "relatively robust" markets, including Texas. "We continue to believe that Texas will not experience anywhere near the same level of housing price declines that we've seen in other more distressed markets," said Horne. "However, outperformance is a relative term." While other major cities have priced low- and moderate-income buyers and renters out of the housing market, we have largely avoided prescriptive policy demands on building design. And, for the most part, we have recognized that shifting public infrastructure costs to builders inevitably ends up coming out of the consumer’s pocket. This has not gone unnoticed, with many economists and land use experts citing Houston over the past year as the city that “got it right.” By that, the experts mean we are the leading “opportunity city,” where our growth policies don’t freeze out upward mobility in favor of attracting an “elite class” of professionals. When real estate prices are artificially increased through both government restrictions and inducements to the “creative class,” it is always low- and middle-income residents who are first hurt, with the entire economy almost always affected later. But because there has been some friction as Houston’s population has become denser, especially inside the Inner Loop, there still exists the temptation to take a well-intentioned but nevertheless wrong path toward centralized government control of growth. City after American city has belatedly discovered “Smart Growth” and “New Urbanism” policies look good — right up until the cost to consumers, the economy and taxpayers is considered. By then, the damage has been done. Planning for growth is healthy, but Houston’s model has been to plan for public expenditures that support privately invested growth instead of requiring private expenditures for public uses. Houston can improve further in this area by creating a long-range plan for public infrastructure that rationally plans for growth while avoiding the temptation to shift such costs to those risking their own capital for growth. Can deed restrictions be made to work better? The answer is most certainly “yes.” Renewal of deed restrictions is cumbersome and requires significant legal costs. The city should help neighborhoods by lending legal help, by making deed restrictions highly visible and by making apparent to buyers what areas on the edges of neighborhoods are subject to development. Regulatory barriers to pedestrian-oriented development should be removed so costly variances can be avoided, but such development should succeed because of consumer acceptance, not regulatory mandates that increase consumer costs. In Houston, we have a diversified economy that produces healthy tax revenues for everything from police and fire protection to improvements in drainage to more parks and more books in our public libraries. Part of our success is derived from the men and women who risk their own wealth to build apartments, homes, office buildings, movie theaters and grocery stores. In truth, developers hire carpenters, electricians, roofers, pavers, design professionals, architects and scores of other Houstonians. Developers and builders don’t deserve disdain for risking their savings and investments on future growth. Neither should local government leaders who understand that policies that foster growth lead to a better standard of living, robust job creation and an economy far healthier than most other major American cities. Moving on to something completely different, a quick response to Ft. Bend County Commissioner Richard Morrison's op-ed against toll roads in Sunday's Chronicle: get used to it. Road needs far outstrip demand in fast-growing Texas, we refuse to inflation index or increase the gas tax (which will soon barely cover maintenance on our existing network), and we refuse to convert historically free freeways to toll roads. The only solution left is tolling all new capacity, and it's the fairest too: users pay, non-users don't. You know, if EZ-tag had been available 60 years ago, I think every freeway in Houston - and probably in the country - would have been tolled from the start. It just makes sense. People should bear the full costs of their housing and commuting choices. And it has the added benefit of a congestion pricing option to push flexible drivers to non rush hours. I don't know why I'm surprised when a politician promises services without costs... but it does get me just a little angry. Finally, I wanted to end with a little Happy Birthday acknowledgment for Houston Strategies: we're four years old as of yesterday (Sunday). Hope you've enjoyed 'em as much as I have. 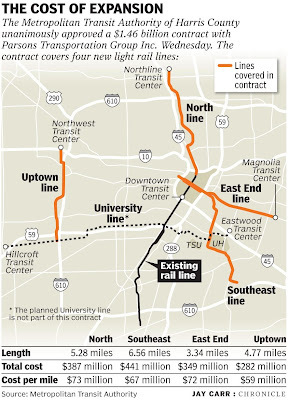 So Metro approved the contract for 4 of the 5 new light rail lines this week. Although there have been complaints about the 2012 plan delays, it looks like Metro used the time - and the intervening economic collapse - wisely to get the costs down to $73 million per mile (from potential estimates as high as $100m per mile). That's still more than the $45 million a mile for the 2004 Main St. line, but that reflects not only inflation but a complete 5-year design-build-operate contract that is much more comprehensive than the Main St. line contract. Metro claims their financial books are solid for the whole thing - let's hope so. As usual, Christof has the details here. A Business Week ranking has Portland, Oregon as the country's most unhappy city, based on crime, depression, suicide, divorce, economy, and other factors. Hard to believe it beat out Detroit. I'm not sure how much their heavy-handed approach to land-use regulation impacted those results, but you'd have to think hostility to cars, increasing congestion, and skyrocketing home prices and cost-of-living wouldn't help - not to mention forcing walking, waiting, and transit ridership during the long, dreary, rainy winter months. The dark side of 'smart growth' taken to extremes. Houston is the #3 energy star city according to the EPA, as the energy capital should be. Good conservation should be part of that capital status. Hat tip to HAIF. If you're curious, here's the Texas list of stimulus projects. Hat tip to... um... sorry, I lost track of who sent me this. Please claim your credit in the comments. A Wall Street Journal blog thinks the floor on oil prices has been reached. I've seen other, similar prognostications, including predictions of more strong OPEC cuts next week. Let's hope so. No desire for another 1980's here (movies and music, yes - local economy, no). Finally, you might want to check out this site called High Trek Adventure that coordinates an urban race where "teams of 2 solve clever clues and face fun challenges all while navigating the urban landscape via foot or on public transportation! It's a scavenger hunt, with all the thrills of the amazing race, mixed in with trivial pursuit, throw in a mini road race and add a dash of cat-and-mouse." Houston's race is Saturday March 14th. I did something similar a couple times when I was a student at Rice, and it was a blast. Would have won, too, if I'd trusted my hack of their software code. Ahh, youth (insert warm fuzzy nostalgia here).